Callum Elder of Peterborough United in action on his debut against Gillingham. A 1-1 home draw with an unbeaten team who started the day on top of League One was seen as a decent result by many last weekend. 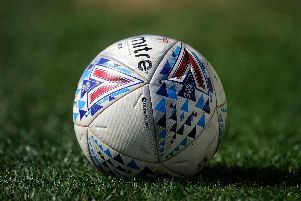 But the Posh players were bitterly disappointed not to have beaten Gillingham at the ABAX Stadium, even though they required a 90th-minute equaliser from Jon Taylor just to rescue a point. New loan signing Callum Elder shared that viewpoint. The 20 year-old Australian delivered an accomplished debut at left-back, but he already knows there is much more to come from both him and the team. “I trained with the team for the first time on the day before the game,” Elder revealed. “And I could tell instantly that I’d joined a quality club with some excellent players. “They also made me feel really welcome from the minute I walked into the club and I wasn’t surprised that we played pretty well against Gillingham. “On the face of it a draw against the leaders wasn’t a bad result, but all the players were disappointed that we didn’t win the game. “We certainly played well enough to take all three points. “I like that sort of mentality and I am sure I’m going to have a great time here. “I felt I played okay, but I can play better and that should come with each game I play. Sydney-born Elder is a graduate of the Leicester City Academy, but he is yet to appear for the Foxes first team. The Aussie Under 20 international played 21 games on loan for League Two side Mansfield last season. Elder added: “I enjoyed my time at Mansfield, but I was looking to step up to League One this season. “Leicester recommended Peterborough as a good club and I agreed with them. “I’m here for a month initially, but I would be more than willing to extend the stay. Elder also played in Tuesday’s Johnstone’s Paint Trophy tie defeat at Millwall. Posh moved for a left-back as first-choice Kgosi Ntlhe failed to recover as quickly as expected from a slight toe injury suffered in the home defeat to Sheffield United last month. Ntlhe is worryingly injury prone for a 21 year-old.